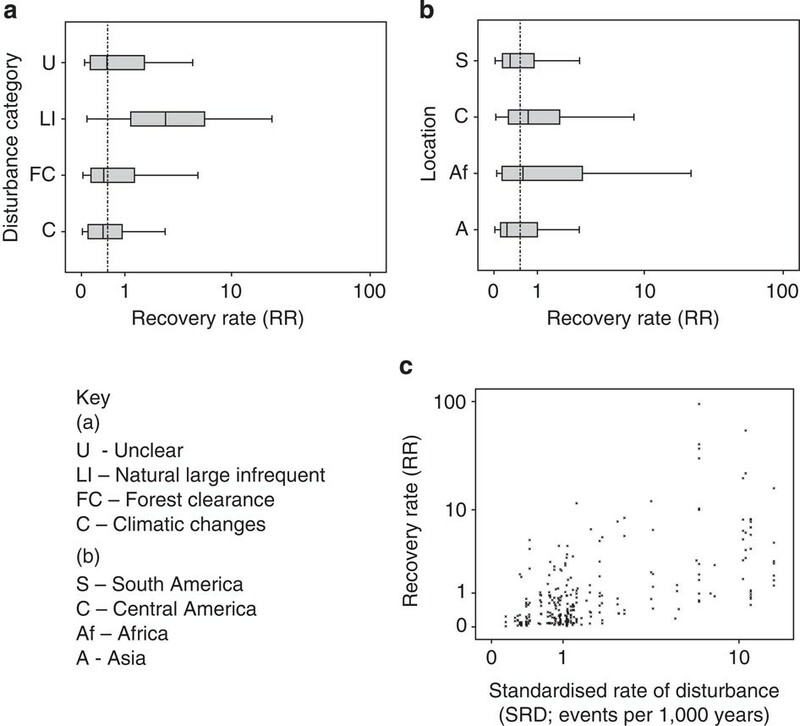 Tropical forest carbon storage is related to tree richness and traits. Or is it? There’s been a lot said about relationships between species diversity and ecosystem function over the last two decades. The general view of these relationships is that diverse ecosystems are more productive, use resources more efficiently and are more stable. 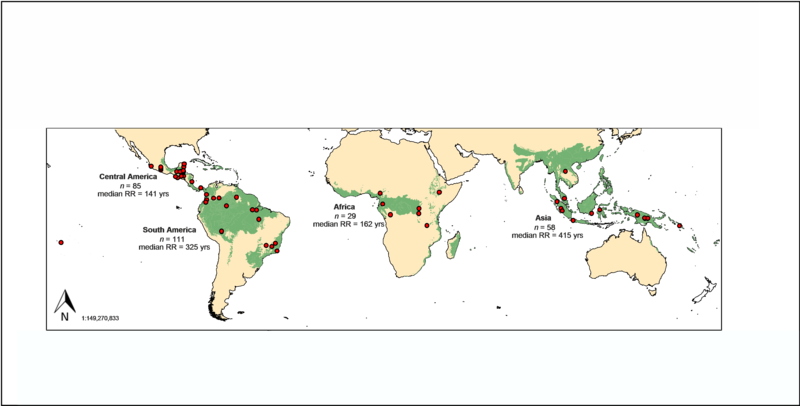 But, and it’s a big but, almost none of this work has been done in forests and even less in mega-diverse tropical forests. Because of this diversity productivity relationships can’t really be described as general. How do we know what is general across the globe if we have only concentrated on temperate grasslands? 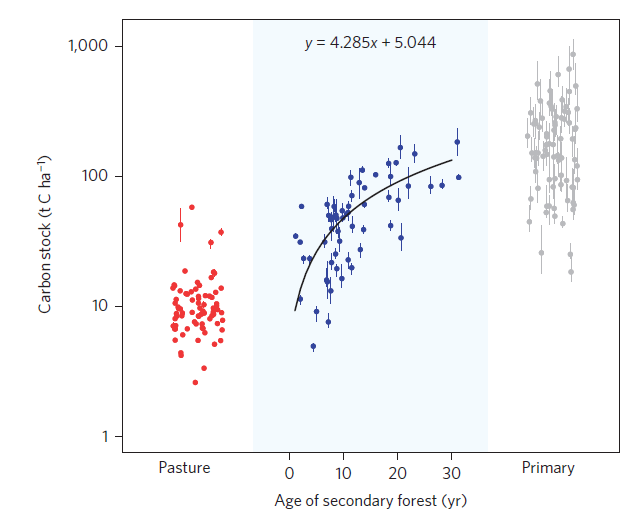 This is something a new paper in Global Ecology and Biogeography by Kyle Cavanaugh and colleagues hopes to set straight. 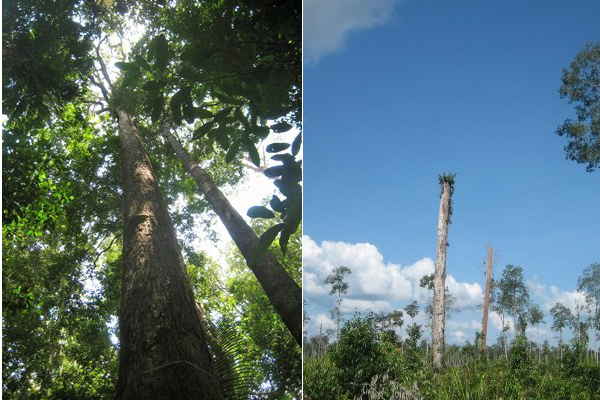 Their study drew on a dataset of carbon storage and tree biodiversity from 59 plots across the tropics produced by members of the Terrestrial Ecosystem Assessment Monitoring (TEAM) Network. The great thing about this work is that all plots were surveyed using the same methods, meaning they should be reasonably comparable. All sites collected measures of aboveground carbon storage, genus diversity, functional diversity – by measuring wood density of trees and potential maximum diameter, and the mean value for wood density and maximum diameter for each plot. All of this was then analysed while trying to account for climatic differences between sites. The general findings of the study were that both genus diversity and the mean potential maximum diversity of species appear to be positively related to aboveground carbon storage. 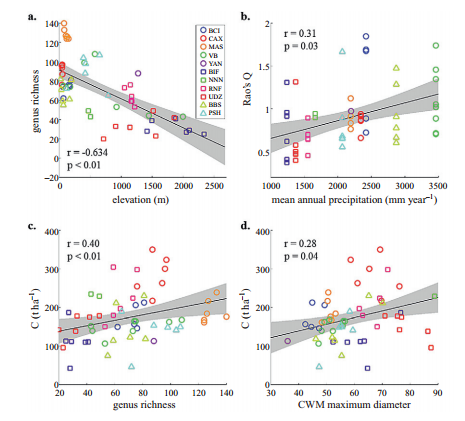 Relationships between site (a) elevation and genus richness, (b) precipitation and functional diversity, (c) carbon storage and genus richness and (d) carbon richness and mean maximum diameter of trees. Stolen from the paper. 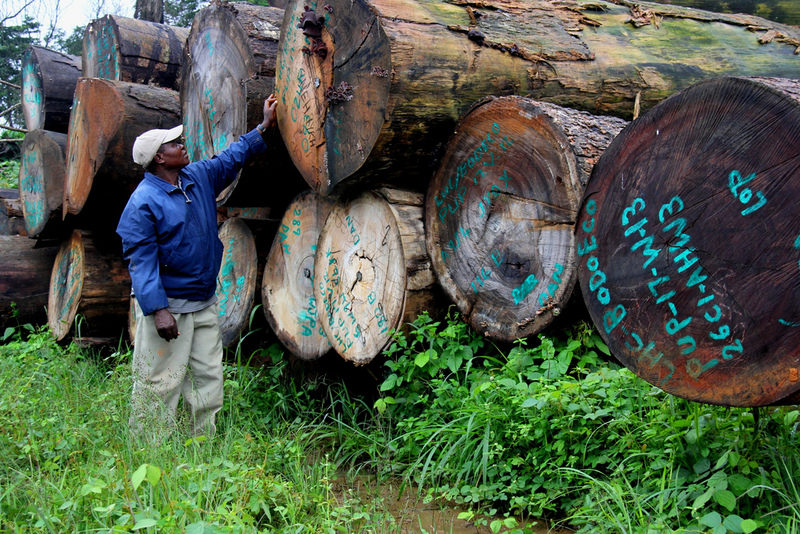 This enforces the view that diverse ecosystems are more productive and that large species may contribute a disproportionate amount of biomass – as I have written before. Very few studies have shown a relationship between diversity and biomass in tropical systems before, so this is exciting stuff. And yet, I still have a few queries about some findings. 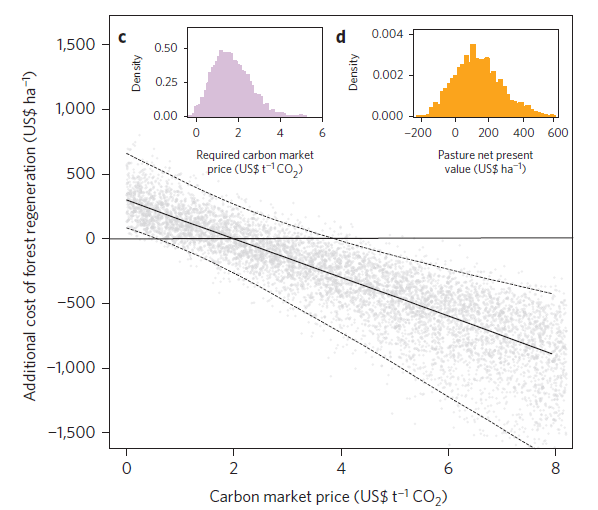 The study failed to find any relationship between climate and carbon storage – a connection that is fairly well established. Also it uses stepwise model selection, which is beginning to become one of my (and others’) pet peeves . I am of the feeling that testing all possible models and then averaging amongst them based on the ones that have greatest support is the best way to do things, and this often comes up with very different findings to stepwise selection. 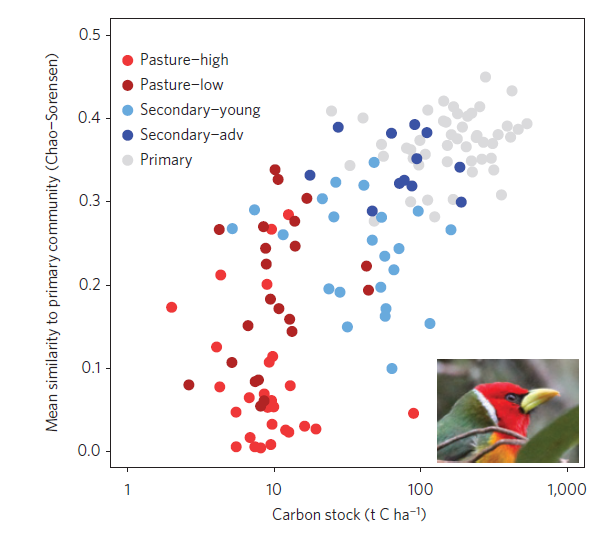 Previous similar work has suggested that carbon – biodiversity relationships are scale-dependant, with positive relationships in small plots and mixed results at larger plot sizes. Given the increasing number of tropical forest research networks I am sure this study will not be the last of its type. Once these get published we will have a better idea of how general these findings are. At the moment I am not completely convinced. When is a trait not a trait? Last week I was on a course on using traits for ecological analysis in Coimbra. Verdict: Unimpressed by the course, but impressed by the beauty of the city. One of the things that kept coming up on the course was what people considered a to be a trait. Apparently the strict definition that the people running the course was something along the lines of “morpho-physio-phenological traits which impact fitness indirectly via their effects on growth, reproduction and survival, the three components of individual performance” taken from Violle et al 2007. I agree roughly with this definition. But there were a few naysayers in our group. Some of them argued that distribution size was a trait or that habitat that a species preferred was a trait. Personally I think these two things are the result of a trait-environment interaction, and are not themselves traits. However,even papers in the Holy Grail of publications, Nature, can get this wrong so I can understand the confusion. 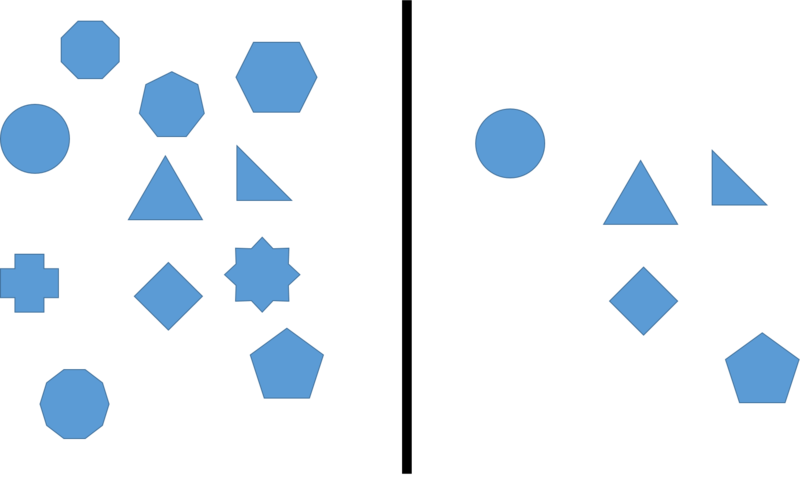 For example, take a regional species pool that is made up of species that vary in traits which impact their fitness. These traits can determine whether a species is present at a particular site. 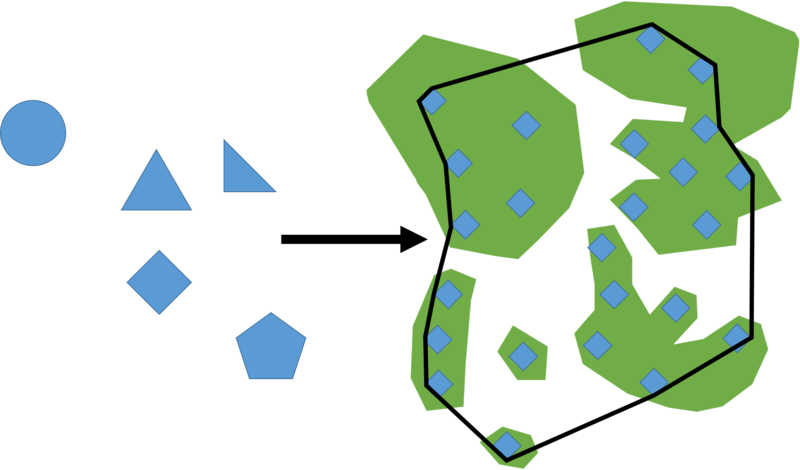 Some species may only be found in particular habitats (green patches) and vary in range size compared to others (black line) but we shouldn’t call these traits. If you add up all the areas that a species is present in you have an idea of a species range and also the habitats they occupy. Therefore it is fairly obvious that these two things are not traits but are rather the products of traits. This is not to say they aren’t useful in some way. Range size (or more accurately area of occupancy or extent of occurrence) is fundamental to one of conservation biology’s flagship projects – the Red List, and knowing the habitats a species uses can be useful in lots of ways. Ecology is fraught with problems of definition (as I have discussed here and here) and personally I think it is one of the things that holds back our science. If our aim is to form meaningful generalisations about how the natural world works, we can’t do it until we agree what the hell we’re talking about in the first place.